Michael will receive a $1,000 cash prize and a world premiere performance of his composition at the 2012 International Viola Congress at the Eastman School of Music. The other finalists were "Hard-Knock Stomp" for solo viola by Dan Visconti; "Sole, curami sì l'alma" for solo viola by Massimo Lauricella of Genova, Italy; "Confusion" for viola and piano by Katerina Kramarchuk of Philadelphia; and "Rhapsody for Viola and Piano" by Nicholas Pavkovic of San Francisco. A group of Cremonese makers raised 20 million yen (approximately $26,000) for the sale of a violin, bow and case, and donated all the proceeds to the Japanese Red Cross to help fund initiatives for children orphaned during the earthquake and tsunami a year ago. 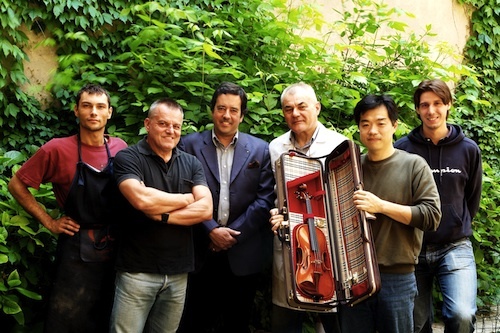 From left to right: Stefano Conia Jr., bowmaker Emilio Slaviero, Dimitri Musafia, Stefano Conia Sr., Suichi Takahashi, Manuele Civa. A violin made by luthier Stefano Conia assisted by his son and makers Civa and Takahashi, a bow by Emilio Slaviero, and a case by Dimitri Musafia, were auctioned off together for the charity in Tokyo. The Association of Italian Violin Makers (ALI), Tokyo dealer Il Violino Magico, and the Japanese music magazine Sarasate helped in the sale. The initiative caught the attention of Kiwanis International, resulting in Conia and Musafia being awarded the Hixon Fellowship for their effort.